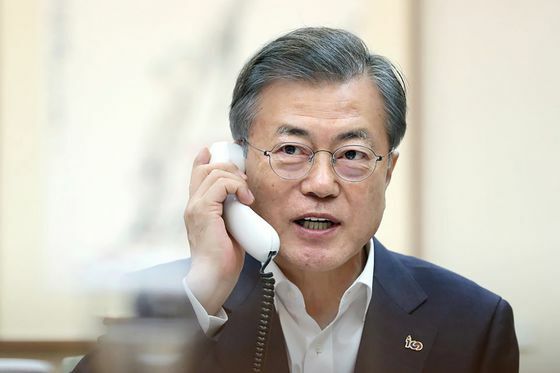 (Bloomberg) -- South Korean President Moon Jae-in will meet U.S. President Donald Trump next month in a bid to get North Korean nuclear talks back on track after a breakdown in the discussions he helped broker led to a slip in his support rate. Moon, a long-time advocate of reconciliation with North Korea, will meet Trump at the White House on April 11, one of his spokesman said Friday. It will be Moon’s first meeting with Trump since the U.S. president abruptly halted his summit with North Korean leader Kim Jong Un on Feb. 28, setting back diplomacy to end Pyongyang’s atomic ambitions. About a month after the summit collapse, Moon’s presidential approval rating hit a record low of 43 percent, according to a Gallup Korea poll released Friday. Respondents criticized him for his policies on the domestic economy and his diplomacy with North Korea, according to Gallup Korea. Moon and Trump will “thoroughly discuss how to cooperate for permanent peace in the Korean peninsula through denuclearization,” presidential spokesman Yoon Do-han said in a briefing Friday in Seoul. Moon has come under fire at home from the conservative opposition for accepting the North Korean leader’s disarmament pledges. The Kim regime has hit him from the other side, withdrawing staff from a new joint liaison office last week and criticizing South Korea as “cowardly” for backing Moon’s U.S. ally’s stance against easing sanctions. The South Korean leader has repeatedly played the role of mediator since he took office in May 2017 amid escalating threats of war between Trump and Kim. Moon has staked much of his presidency on his ability to put the two men on a path to peace, including a surprise trip north of the border to meet with Kim and help rescue their first U.S.-North Korea summit last year in Singapore. 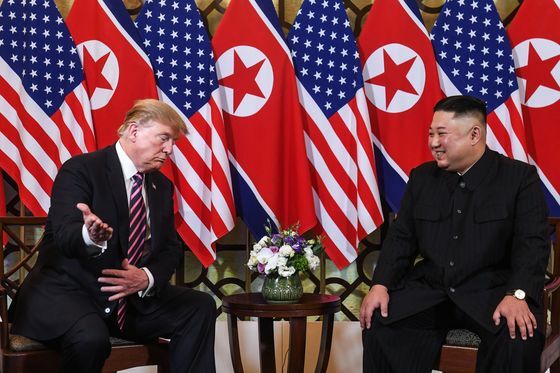 Since the second summit last month in Hanoi, North Korea has shown irritation toward Moon, in what analysts said may be a tactic to push him into presenting a more sympathetic view of Pyongyang’s quest to ease sanctions choking its moribund economy in Moon’s dealings with Trump. “Moon will naturally improve his relations with North Korea only after he’s successful in his role as a facilitator,” said Kim Yong-hyun, a professor at Dongguk University’s Department of North Korean Studies. Apart from the liaison office, North Korea has not yet responded to a recent invitation from South Korea for military talks to help ease tension along their heavily militarized border, South Korea’s defense ministry said. The North Korean leader, seeking support in his nuclear dealings, may be looking to hold his first summit with Russian President Vladimir Putin, South Korean lawmaker Kim Min-ki of Moon’s ruling Democratic Party told reporters Friday after being briefed by intelligence officials.